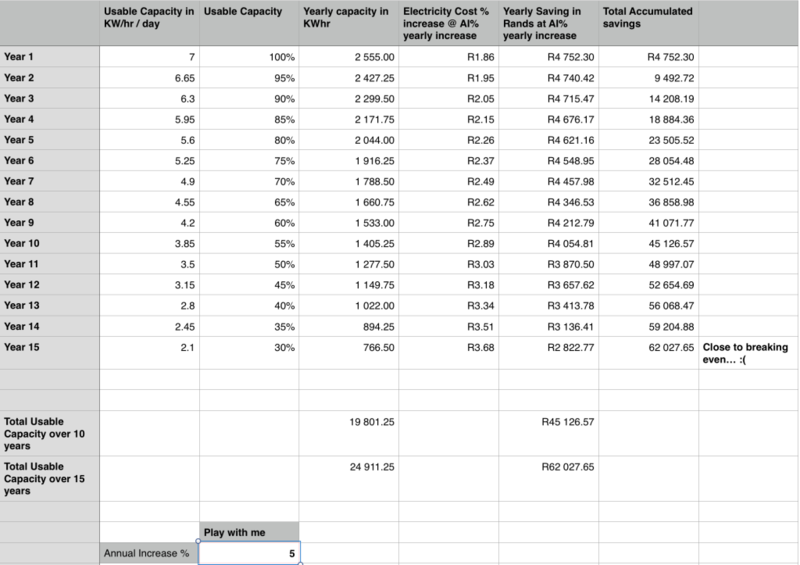 The Tesla PowerWall is finally becoming available in South Africa, so I thought I’d do some “30% for math” calculations to work out payback periods. Predicted cost at the moment for a daily use PowerWall is $4000. Rand is currently hovering at R16 (lets hope Zuma doesn’t open his mouth in the near future, as that historically has lead to large drops in Rand values). Assuming R16 x 4000$, we have a cost of R64,000 for the battery itself. Obviously thats a large sum of money. Does it make sense / cents to buy one? 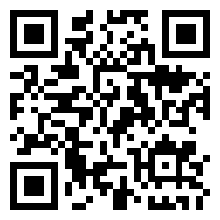 Lets have a look. First up we need to try to work out total lifetime costs. The Tesla Powerwall includes a 10 year limited warranty. The limited warranty covers defects in parts and workmanship, as well as at least 60% energy retention after 10 years, provided it is registered and used as intended. The Tesla Powerwall is designed for daily use applications like self-consumption of solar and load shifting. Assuming full daily cycles, Tesla Powerwall is designed to provide energy for 3650 full equivalent cycles which is equivalent to 10 years of use. Thats interesting, as it now gives us an indication of cycle usage. From that, I can infer that each year we’ll see a drop of around 5% in capacity. So year 2, we’ll see 95% of original capacity, year 10 down to 60% of original capacity, and at say Year 15, around 30% of original capacity. At year 15, I’d probably want to replace the unit, or have it as a secondary storage device..
With that in mind, we can do some math! I’ve made a basic spreadsheet using those figures and worked out payback periods for the units. I can’t predict Eskom pricing, so I’ve gone with current CoCT pricing per KW, and worked with annual % increase’s. Total lifetime I’ve kept to 15 years, although you could probably scrape another year or two out of the units. I expect battery replacements to at least have halved in current Rand / Dollar terms in 10 years though, so replacement should be cheaper assuming Zuma doesn’t do any more Nene’s..
You’ll see that it currently doesn’t make sense to use a PowerWall at a yearly 5% increase, even at a 15 year time frame. It comes close, but no cigar..
At a 10% annual increase (which might be closer to what Eskom pricing will eventually be than at 5%), we see breakeven in the 12th year of ownership. By 15 years we’re safely into profit. 15% annual increase see’s break even at Year 10. Its unlikely that we’ll see continued 15% increases though, I guesstimate using thumbsuck that we’ll see continual annual increases of 8%, which leaves us breaking even at around Year 13. Feel free to play around with the values, I’ve uploaded the Numbers file here (as I’m a larney Mac user), or as an Excel sheet here. The Rand Dollar rate is going to be the main cost influence on whether the PowerWall makes sense. If the rand drops further (and the indications are that it will), then it doesn’t make sense at R20/ dollar. If by some miracle the rand recovers to say R14 or R12 to the dollar, buying a PowerWall is a no-brainer. NERSA approved increases may or may not beat my guesstimates. Historically we’re much more expensive per KW than 10 years ago by a large factor, so its likely that a moderate value of 10% increase per annum is going to correlate with actual figures. This will also increase once Eskom/ Muni’s introduce further daily connection fee’s and other non tariff increases on top of per KW pricing. I don’t calculate round trip values for Electricity in /out of the PowerWall. Tesla documentation indicates that this is 92%, so final KW generation figures probably should be discounted by 8% for further accuracy. I also assume you’ll be generating electricity to go into the unit from a solar install. Costs for that are not included, as we are looking purely at the viability of the PowerWall. 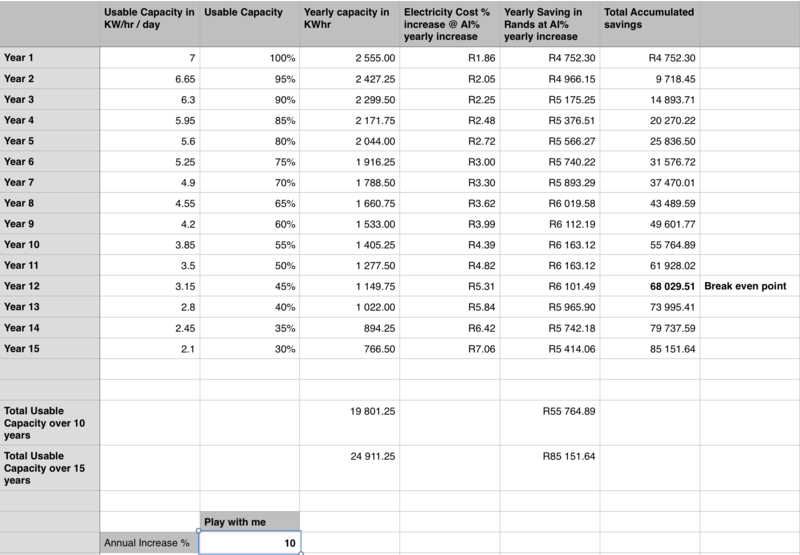 While I can do full system calculations, its already clear that Solar generation is already cheaper than Eskom in South Africa, and has been for a few years no. Rehashing that again is of no interest to me. This entry was posted in Tesla, Theory and tagged math, powerwall, south africa, tco, tesla on February 15, 2016 by lawrence.